I have made several previous posts about Jim Cramer, check here and here, and have suggested people should watch Jim Cramer for entertainment purposes, not for serious investment advice. Slate Magazine's Henry Blodget has a new article about Cramer, where he suggests that Jim Cramer "has committed professional suicide," by admitting that he engaged in trading practices that are questionable at best, possibly illegal? Aside from those potentially serious ethical and legal issues, an even more important question might be: How well did the performance of a portfolio of Mr. Cramer's stock picks in 2006 stack up against a portfolio of passive index funds? Unfortunately for Cramer's followers, not very well. 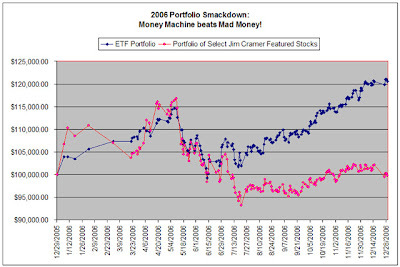 According to Mad Money Machine, the return in 2006 for a portfolio of mostly Vanguard Index funds was +20.6%, compared to a -0.20% loss for a portfolio of "Select Jim Cramer Featured Stocks." A $100,000 investment at the beginning of the year would have grown to $120,612 by the end of 2006, compared to only $99,805 for Cramer's picks (see chart above, click to enlarge). Bottom Line: Watch Cramer for entertainment purposes only, call Vanguard or Fidelity for investment advice on index funds. Or read "Random Walk Down Wall Street: The Time-Tested Strategy for Successful Investing," by economist Burton Malkiel, who is a strong advocate of index funds. Any time someone keeps TELLING (in this case, shouting) you how much they are going to do for you, hold on to your wallet. Followed him for awhile, didn't make any money and I sold off the stocks about 2 years ago. I recently revisited those stocks and found them pretty close to where I sold them. Read the book, "Random Walk" and I use it often when people ask for investment advice. Everyone always seems to be reverting back to the Random Walk theory...all stocks are priced to perfection. Please, the study that the goons at madmoneymachine is a good example of randomness, but its based on an extemely small sample of a few stocks that Jim Cramer had once recommended. Most situations are not random and many are easily predictable. Buy MO, its products are addictive, buy T when Ma Bell got back together, and industry consolidation allowed it to charge more. Buy GOOG, representing a whole new industry that any thirteen year old could have told you was going to be the next big thing. Jim Cramer may not perform in aggregate, especially since you cannot know what his current views are on a stock that he recommended three months ago, but he can alert the small investor to situations where the odds are better than average. Cramer and others like him can be a valuable resource for the individual investor.